Radprofile provides your operators with the tools they require to reduce lead times and optimize your laser, plasma, water jet and flame cutting machines. Designed to seamlessly integrate with Radpunch the RADAN punch/profile solution delivers optimization for punch profile combination machine tools. Radprofile seamlessly integrates the whole programming process of geometry creation, nesting, cut path profiling, sequencing, code generation and finally DNC connectivity to the machine controller. The seamless integration delivered by Radprofile provides an easier to use experience for your operators, whilst accuracy and consistency of programming is maintained with the collation of process critical data in the Manufacturing Database (MDB). Material, lead-ins, lead-outs, tagging, and machine tool specific cutting technology data are stored in the MDB in readiness for instantaneous distribution when required to assist an operator or automated process. Understanding the sophistication and the limits of each machine tool individually is the key to driving it efficiently; Radprofile will assist your operators to optimize your manufacturing capacity to within those limits for all of your machines. Optimizing the tool path, cutting technologies and cutting sequence for a profiling machine is paramount to the efficient programming of the machine and thus the reduction of the cost to manufacture a part. As profiling machines, particularly laser profiling machines become faster and more sophisticated the integrity of the part in the nest sheet and the safety of the machine head become even more paramount. Radprofile intelligently applies the profile tool paths automatically at the nesting stage to maintain the quality and integrity of your parts, whilst also optimizing the cutting sequence and ensuring cutting head safety, thus enabling the machine tool to perform to its optimum potential. Radprofile supports automatic common line cutting which enables the downstream nesting process to fully optimize material utilization, whilst also benefiting from reduced cutting times and assist gas costs. 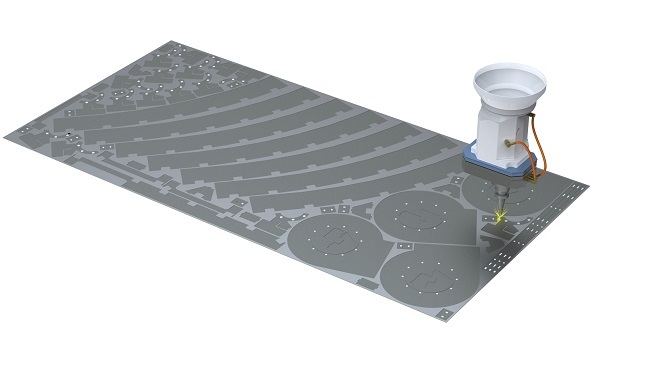 Parts identified for common cutting can be controlled to cut in clusters to maintain sheet rigidity and remove tolerance problems associated with common cutting in large quantities. The power of automation with the ability to control by your preferences. The Radprofile programming solution provides your operators with easy to use software that can be educated to adopt your preferred practices and processes. Lead-in and Lead-out preferences, tagging, preferred profiling sequences all these and more can be defined relative to material type, thickness and machine tool in the Manufacturing Database. The MDB expands with your business. The introduction of new customers, new products or new machines brings into your manufacturing environment the need to control new material, strategies and new practices. The MDB ensures consistency of programming for these new criteria for all of your machines, which translates to less rejects, less rework and higher returns. If manual control is your preference this is in abundance with Radprofile enabling an operator to take full control of the programming process at any stage. The ability to interact manually and override any of the automated processes gives a Radprofile user the power to tackle the most difficult jobs with ease and confidence. Radprofile is a fast, modern programming application designed and written by RADAN to assist a programmer in transferring data from CAD to NC code. The seamless interface, the automatic processes all assist the operator in this process. Unfortunately in reality production workflow is not always that consistent. Problems downstream, manufacturing change requests, reject rework requests all require an operator to be as fast and efficient. Radprofile enables an operator to jump into the programming process at the point where that the change is required; but it does not necessarily demand that the whole programming process is repeated. A machine tool is only as efficient as the software driving it, so that is why we personally install every Radprofile post processor to ensure that it is commissioned to match your machine tool and controller. It is your production efficiency that it is going to be controlling, that’s why your software is important to us. Radprofile intelligently applies the profile tool paths at the nesting stage to maintain the quality and integrity of your parts, whilst also optimizing the cutting sequence and ensuring cutting head safety, thus enabling the machine tool to perform to its optimum potential.